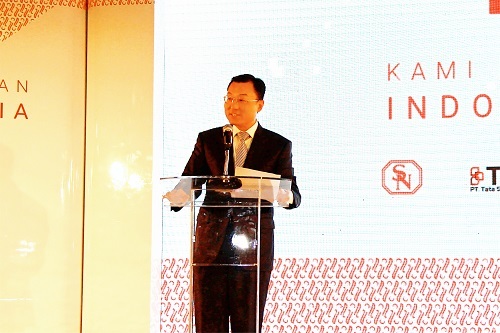 On 10 Feb, Ambassador Xie spoke at the Xiaomi "Made in Indonesia" event and shared success stories of the win-win cooperation between China and Indonesia. As remarked by Ambassador Xie, the bilateral cooperation between China and Indonesia has reached a new milestone with the transition from traditional trade and project contracting to investment, technological transfer, personnel training and joint production. Xiaomi is a fine example of Chinese manufacturing in the global market. Its smartphone market share now ranks 4th in Indonesia. It shows that Indonesian customers not only recognize Xiaomi's quality and service as well as Chinese manufacturing but also have high expectation and confidence in our bilateral cooperation. 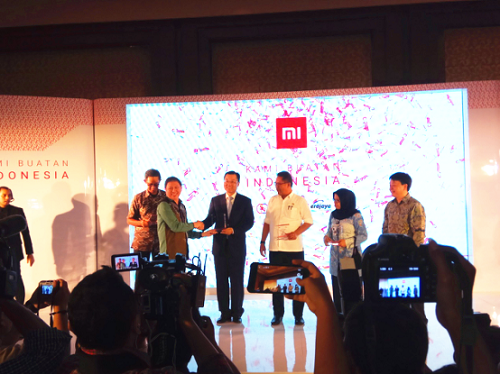 As pointed out by by Ambassador Xie, Xiaomi is among the nearly 1,000 Chinese enterprises investing in Indonesia. These enterprises have brought to Indonesia their capital, technology and advanced managerial expertise, which have helped to boost local revenue and employment and strengthen Indonesia's economic growth. Last month, the Chinese Chamber of Commerce in Indonesia held its first press conference, during which several Chinese company executives introduced their business and contribution to Indonesia. Take the China Harbour Indonesia as an example, it has created over 20,000 employment opportunities for the local communities and the Morowali Tsingshan Industrial Park alone offered over 11,000 jobs. Huawei Indonesia now has over 400 local partners and has indirectly generated over 20,000 jobs in the hi-tech sector. The Julong Group is promoting "joint plantation" on a total cultivated area of over 10,000 hectares. The project involves over 40 local villages and has benefited over 20,000 people from over 5,000 households. Ambassador Xie expressed his hope that Xiaomi and other Chinese enterprises will continue their efforts to become a good corporate citizen in Indonesia and continue to improve their products and services, abide by local laws and regulations, respect local traditions and customs, better integrate into the local society, devote to charity and shoulder their fair share of corporate social responsibility. Chinese enterprises, while developing themselves, will provide local customers with top-notch products and services and contribute to Indonesia's growth. Meanwhile, we hope our Indonesian friends would take Chinese enterprises as their true friends and partners and help them better integrate and localize, remove barriers in such areas as land acquisition and working permits and create a sound business environment. We highly appreciate the efforts by President Jokowi and his administration to improve business environment and attract foreign investment. Ambassador Xie said: as Xiaomi forges ahead over the past few years, we've also seen rapid and vigorous progress in the One Belt and One Road initiative. Since it was initiated over 3 years ago, the OBOR has followed the principle of wide consultation, joint contribution and shared benefits. It upholds common development and aims to achieve win-win cooperation. It is not China's solo but a chorus comprising all countries along the routes. Until now, over 100 countries and international organizations have given warm responses and support to the initiative. More than 40 countries and international organizations have signed cooperation agreements with China, and our circle of friends along the "Belt and Road" is growing bigger. Chinese companies have made over $50 billion of investment and launched a number of major projects in the countries along the routes, spurring the economic development of these countries and creating many local jobs. It's indeed a rare highlight in today's global economy. Ambassador Xie said: China and Indonesia are not just each other's good neighbor and good friend, but also important partner in jointly building the 21st Century Maritime Silkroad. Under the leadership of President Xi Jinping and President Joko Widodo, the two countries work to synchronize the 21st Century Maritime Silkroad initiative with Indonesia's Maritime Fulcrum strategy and our bilateral cooperation reached new heights. While remaining as Indonesia's largest trading partner in 2016, China has grown from the 10th to the 3rd largest investor in Indonesia. The first 11 months in 2016 registered a total number of 1.34 million tourists from Chinese mainland, making China the largest source of overseas tourists. Official statistics from the Indonesian government show that Chinese tourists spend an average of USD1,107. Chinese tourists alone have contributed over USD2 billion to local revenue. Now we are working to realize the vision by President Jokowi to attract 10 million Chinese tourists by 2020. Meanwhile, major flagship projects including the Jakarta-Bandung High-speed Railway are moving forward steadily and bilateral cooperation has expanded into such areas as infrastructure, production capacity, trade, investment, finance and e-commerce. A number of cooperation projects with both economic and social benefits are delivering more benefits to our enterprises and peoples. As concluded by Ambassador Xie, today we see a lack of growth momentum in the global economy, rising uncertainties in global finance, backlash against economic globalization and resurgence of protectionism. All the countries are in the same boat. We should stand together and make use of every opportunity to jointly tackle the challenges and guild globalization to a better future. Both as major Asian countries and important emerging economies, developing countries and members of the G20, China and Indonesia are the twin engines driving the global economy. Facts have proven that we compliment each other and our bilateral cooperation is mutually beneficial and win-win in nature. China looks forward to working with Indonesia to build a open global economy, share both opportunities and benefits, achieve common development through cooperation, deliver benefits to our people and inject new impetus to global economy. 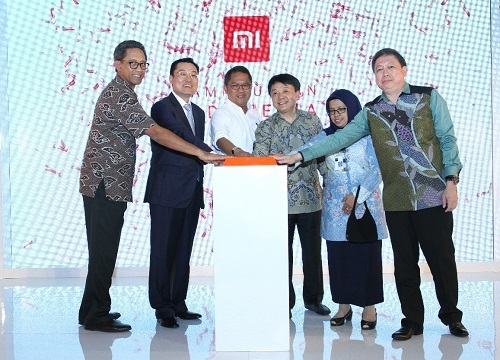 The Xiaomi Made in Indonesia event was hosted by Mr. Wang Xiang, Senior Vice President of Xiaomi and attended by Mr. Rudiantara, Indonesian Minister of Communication and Information Technology, Mrs. Widayanti,Director General of Domestic Trade and Mr. Putu Suryawirawan, Director General of Metal, Machinery, Transportation Equipment, and Electronic Engineering.